I wrapped up my summer travel with a trip to Montreal, Quebec (Canada) for DebConf 17. This was my fourth time attending the annual Debian conference--which changes countries each year--and my first time presenting. 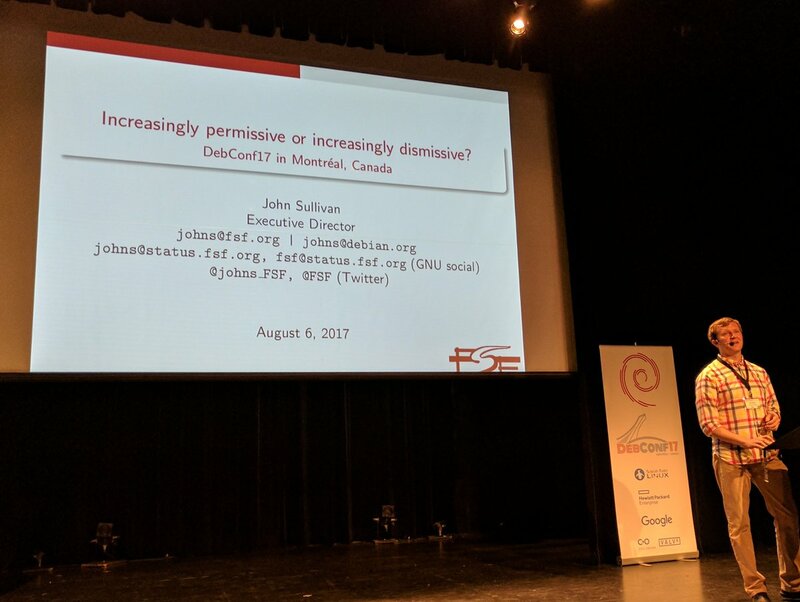 John Sullivan, the Executive Director of the FSF, joined me and nearly four hundred of our closest Debian friends for a week of celebrating free software, working together on cool projects, and talking endlessly about what we can do for user freedom around the world. Speaking at DebConf was a big deal for me. Participating in the Debian community was an important part of what took me from being a person who used free software to an active member of the free software movement. Presenting at a conference provides a different kind of opportunity to interact with everyone there. As someone who organizes conferences, I feel as though the speakers do a huge amount of work to shape the experience that attendees have, and that by providing individuals with microphones and stages, we create a conversation that helps the community learn, explore, and grow. DebConf17 kicked off with Open Day, where John was to deliver a session titled "Freedom embedded: Devices that respect users and communities." The same series of thunderstorms, a tornado warning, and other threatening weather forecasts that caused me to arrive in Montreal a day early, resulted in John's flights being delayed several times. Since he was trapped in New York, John and the DebConf organizing team agreed that it would be best for me to deliver the session on behalf of the FSF. This kicked off what became a great week for the FSF in Montreal. John managed to arrive in time for his other session, "Increasingly permissive or increasingly dismissive?," on the lack of any data to support the exaggerated claims we've been hearing about the decline of copyleft. We held a birds-of-a-feather (BoF) session for FSF members and potential members in Debian. Speaking with members of the Debian community while wearing our FSF hats is important: the FSF does not officially endorse Debian as a distribution due to some outstanding disagreements, but there is a lot of common ground and shared goals centered around the hope of one day having all software be free. We think that Debian has done a lot of great work for free software, and believe the project can become an even stronger force. 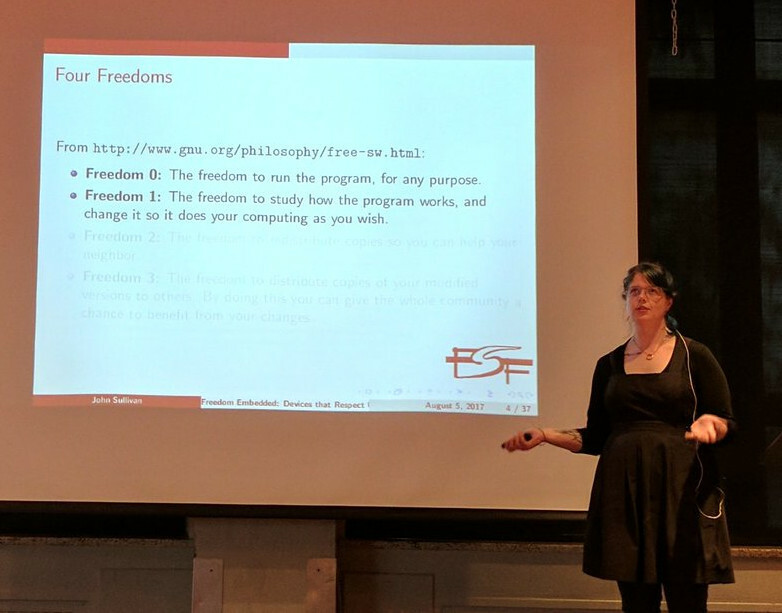 These conversations help us find new ways to work together moving forward, and, in general, speaking with FSF members and those involved in the free software movement is invaluable to us as an organization. I also got to organize a Debian Women meetup with Valerie Young, a LibrePlanet speaker, reproducible builds hacker, and Outreachy alum. As a group, we talked about the role that mentorship has had in our involvement in free software, and what we'd like to see more of in the future. It was fun for me personally, and interesting as someone who wants to see the movement grow. I'm hoping to bring some of the ideas that came out of it to the FSF. This was also the final time I presented "All Ages: How to build a movement." All Ages, a talk on ageism in technology, debuted at HOPE XI. My friend, internship mentor, and FSF alum Deb Nicholson and I have given this talk four times over the past year. It changed a bit each time, including new things we learned and new ideas we came across after each presentation. I think I speak for both John and myself when I say that DebConf 17 was a lot of fun. We learned an incredible amount (including the efficacy of plane travel versus bicycle travel). 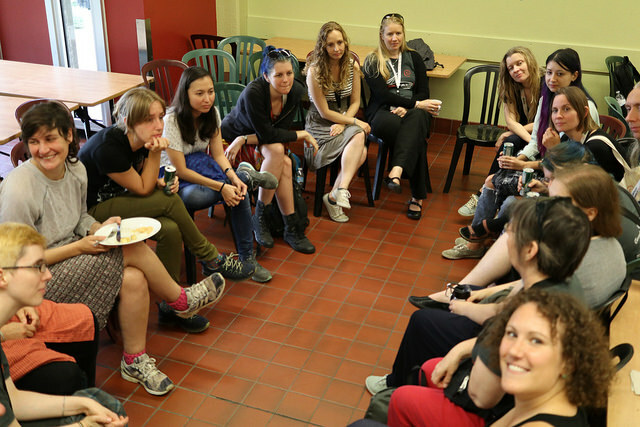 Connecting with our free software friends and making new ones, meeting people in the community, and hearing their free software stories is an invaluable experience for us. In the upcoming months, FSF staff will be at All Things Open. More details coming soon! We hope to see you there.